Ancient Stones - Lothian - 016 Custom Stone, George Hotel, Haddington. 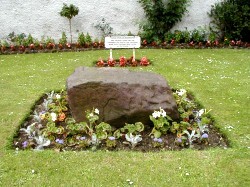 The Custom Stone can be found in a small public garden to the west of the George Hotel, in the town centre of Haddington. The stone is dark in colour and of a well rounded rectangular shape, measuring 0.90m long by 0.40m wide and 0.30m high. The stone formerly stood in the High Street, where a circular formation of cobble stones marks the site. It was removed to its present site a few years ago. Haddington is just off the A1(T) to the east of Edinburgh and the George Hotel is to the west end of the town centre. This site is not indicated on Ordnance Survey maps. In the town centre and surrounding streets. customs were levied in the burgh." I was of two minds about including this stone in the database or not. It's certainly no megalith but it does have a history and has been preserved when many stones have vanished over the years. Yes, it does deserve a place.